Breakfast product manufacturers seems to be having a little trouble with chocolate and vanilla these days. They're trying to treat the flavors like fun-loving rivals by placing them in separate cereal nuggets or opposite sides of a toaster pastry with the hopes that the flavors will clash and play off each other to make a more interesting product. Here's the truth about chocolate and vanilla... sure, they have a contrast in color and flavor, but when you put them together they get along so well that a new flavor is created... a sort of muted, mellower chocolate. That's what you get in Cocoa Puffs Combos. 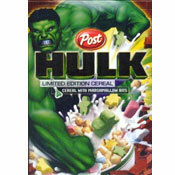 With it's separate brown and yellow-white cereal pieces, you expect some contrast and appreciation of the dual flavors. But when the chocolate balls get together with the vanilla balls in your mouth, the result is simply a toned-down Cocoa Puffs flavor. To it's credit, the vanilla is a slight bit more noticeable than it was in two similar products I reviewed recently, Kellogg's Cocoa Krispies Choconilla cereal and Kellogg's Chocolate And Vanilla Pop-Tarts Splitz. In those products, the vanilla seemed to just get cancelled out by the chocolate. In Cocoa Puffs Combos, you sense a hint a vanilla, but not enough to make a big impact. This cereal manages to retain most of the fun of original Cocoa Puffs. The texture of the pieces are the same. This cereal might even seem a little more sweet. It's just that is has less chocolate flavor, and that's something I've never heard someone request. "I like Cocoa Puffs, but I wish it had a little less cocoa flavor". That's Cuckoo. Nutritional information: Each 3/4 cup serving has 110 calories, 1.5 grams total fat, 0 grams saturated fat, 0 grams trans fat, 23 grams carbs, 1 gram dietary fiber, 11 grams sugar, 1 gram protein and a 10% or 25% spatter of many of the vitamins and minerals listed. 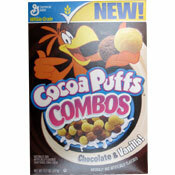 What do you think of Cocoa Puffs Combos? Why can't they just bring back Rocky Road? I love this cereal but I can't find it at the stores anymore. :'( I purchased the regular ones and they're not that good anymore... I think they changed something. not digging the "extra chocolate explosion puffs", I think it's too much, maybe? This cereal is better than the original Cocoa Puffs, but I'm having trouble finding them so I can buy them. The combo cereal taste like (swear removed). All artificial (unsavory word removed). The cover & logo character is the only this attractive. I grew up eating cocoa puffs, and I LOVE vanilla, so when this came out I had to try it. I absolutely LOVE this CEREAL!!! Its so much better than regular cocoa puffs. This is one of the only cereals I eat now!! It isn't even cocoa puffs with vanilla -- it's artificial cocoa flavoring (not even the original HERSHEY'S chocolate it was originally made with), and freaking Kix. I poured this into my cereal bowl the other day and there were more of the vanilla pieces, with only a sprinkling of chocolate balls here and there. I almost felt cheated... they really need to bring the classic flavor back. I Cannot Describe the Flavor But It Is Bad.